After many years of anticipation, HLS30-93069 finally made the 90-mile trek to its new home yesterday. 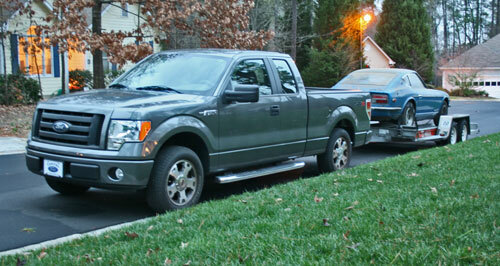 As shown above, I loaded it onto a car carrier and borrowed my dad’s truck for the event. Naturally, it poured down rain the whole drive. Completely dry before and after, of course. 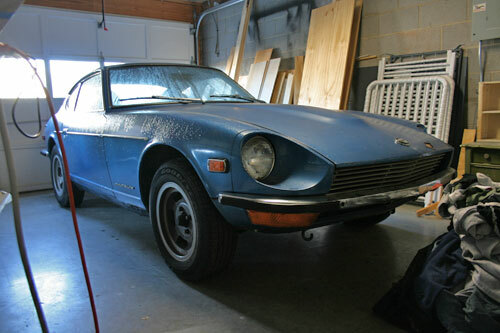 I was more than a little frustrated with that turn of events given that it was moisture that caused the bulk of the 240Z’s current issues. I waited until this morning to enlist my brother-in-law’s help in rolling it off the car carrier and into the garage. Fortunately, 2350 lbs or so isn’t a whole lot of car to push around, so I don’t foresee any issues rolling it in and out of its spot by myself when the need arises. 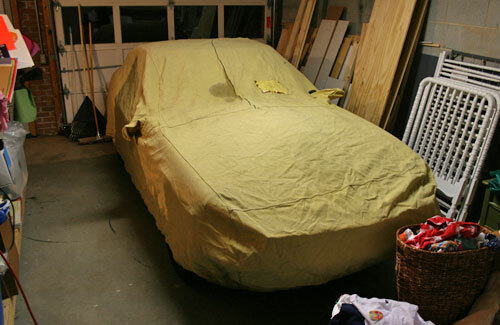 In the garage, still drying off. One of the prerequisites to actually digging into the restoration is building storage shelves and racks around the perimeter of the garage. We need space for the bits that get removed from the Z as well as general storage for the house itself. After a gentle bath to remove whatever remained of 8 years of dust the rainstorm didn’t wash off last night, the Z was tucked in under an old car cover. Truth be told, it’s more there to protect my family from the car’s disintegrating rubber bumper strips than to shield the car from inadvertent kid scratches. Cleaned up the engine bay a bit and reinstalled the factory orange air cleaner. 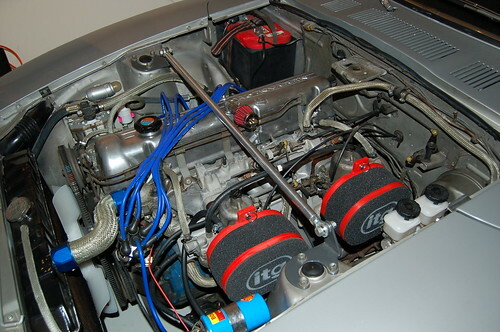 Interesting Z tidbit: According to a reputable SU carb expert, the simple sheet metal air horns built into the inside of the air cleaner box flow somewhat better than any aftermarket units. 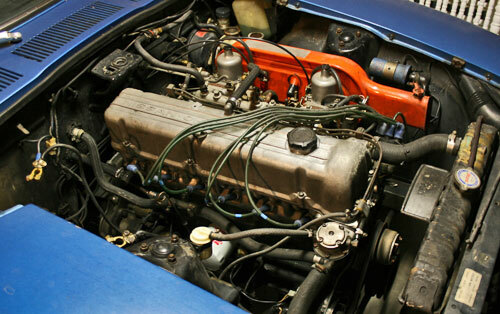 Many early Z owners install non-factory air horns in pursuit of a looks and performance upgrade, but for the latter, there’s really nothing better than the orange OEM piece. A shot of the cause of many of the car’s issues: A rusted-out inner fender directly beneath the battery tray, up against the firewall. Driving the car in the rain, water has a direct path through the fender and firewall, down into the passenger floor pan. I also completely removed any vestiges of the ill-advised electric fan conversion and its associated wiring, and drained the oil. The oil looked clean—there were no metallic flakes at all, but I doubt that’s conclusive as I’m sure I changed the oil immediately following the engine fire incident. I racked my brain trying to remember if there were any visible particulates in the oil then, but for the life of me I can’t recall. In any case, the engine’s coming out and going to be torn down and checked. At least it’s home. Feels good to have the Z where it belongs. That’s great. Glad the stage is almost set for this project (excepting the required shelving, of course). I’m sure your legion of fans are eager to know exactly what your plans are for the car…or do you even really know, yourself? Can’t wait for the next installment. Better get crackin’! Thanks John. There’s a lot to do before I can really dig in, but the timing was right for moving it into our house at least. As far as project goals, I kind of see two stages: The first part will get the car to a point where the body is completely sound, painted and rustproofed, the engine is rebuilt, the dash is replaced with a non-cracked unit and the driveline and suspension are refreshed. The second part will be more gradual, and will involve things I can do to the car over a weekend, like new seats, or engine/suspension/wheel tweaks and the like. I kind of visualize it like a mountain with two grades on the way to the summit, one steep and the next more shallow. My restoration isn’t going to be as extensive or OEM-obsessed (I intend to leave off the emissions stuff, among other things), but that site does kind of give me a ballpark for the scope of the endeavor. That’s quite the project. Probably take you what, a year or so to finish stage one you think? I like their new tire size. Looks good on that car. Not crazy about the wheels or the type of tire they used (I’ve had some experience with the MXV4’s…definitely not a decent performance tire). The tire size of the orange resto car? Yeah, I like it too. The slotted mags are nice but I’d forgo the chrome. Yuck. I’d love a set of 15″ Panasports or other vintage wheels for mine when the time comes. The big question is where does the E34 live now? Is it as ill-fated as mine that it has to live outside? Nope. 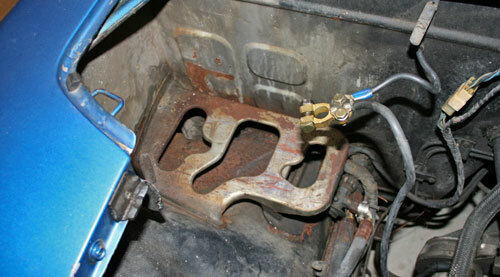 It was a tight fit, but with some creative rearranging (the engine hoist is bulky), I got both of ’em in last night. 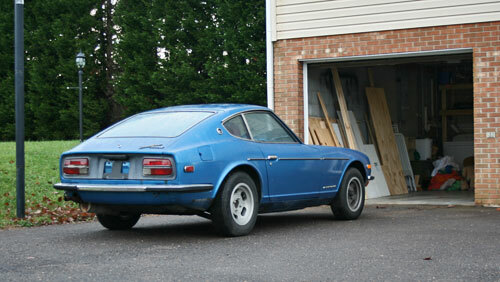 One of my ongoing goals for the project is to be able to get both cars in the garage on a regular basis. Hence the need for more—and creative—shelving. There’s a world of difference between hopping into a 55° garaged car and a 20° iced-over car in the morning.